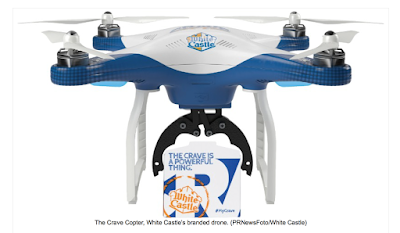 MSE Creative Consulting Blog: Saturday Fun: "As God Is My Witness, I Thought Turkey Sliders Could Fly"
Saturday Fun: "As God Is My Witness, I Thought Turkey Sliders Could Fly"
White Castle is yet another one of the many, many successful national firms founded in Wichita. They have come up with a very clever idea: Dropping turkey sliders, in Cincinnati, from drones in homage to the "Turkeys Away" episode of WKRP in Cincinnati. If you've never seen it, here is the 30-minute program condensed into 12. The best part begins at about 4:30. It is well worth your time if you have never seen it!! If you would like details on the White Castle turkey slider drop, go here.